Along with the option for partial payments, the plugin allows you to insert the cost of a users cart in points and their current balance in your checkout and/or cart page. You can also set what label you want to use for each item. The total cost will be visible for everyone, however balances will only be shown to users who are logged in and are not excluded from the point type you are accepting as payment. You can find your Checkout Totals settings on the WooCommerce > Settings > Checkout page. It will be on the bottom of the page, after your Partial Payment settings. 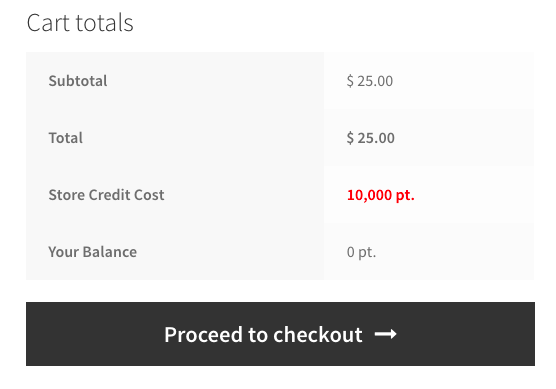 You can select where to insert the point cost and balance either on the Cart page, on the Checkout page or both. You will also need to make sure the label fields are not left empty or nothing will be shown.